Before the second world war, the BBC had a radio circle club for children to join. 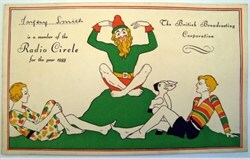 This is the BBC Radio Circle Membership certificate from 1933. 8" x 5".